Letter to the Editor by George Braff w/ follow-up. The current polarization of our Big Sur community over short-term rentals fails to deal with the real underlying issue: Does any individual citizen have the right to knowingly violate/disregard a law which has a direct impact on her/his neighbors? Clearly no! Presently, the law, or lack of permission to the contrary, prohibits short-term rentals in Big Sur. We have multiple owners breaking the law again and again. How can this continue? Why is it tolerated? Why doesn’t the county stop this illegal activity? To paraphrase Thomas Hobbes: A law without a sword is merely words. Code enforcement, burdened with this problem, has chosen not to enforce the law, and more significant- ly, does not have “the teeth” to stop/prevent this behavior. Code enforcement was not given the statutory authority to jail and/or levy hefty fines, so the short-term rental activity persists. Minimal fines are a cost of doing business to the short-term rental contingent. Their dishonest behavior por- tends the disintegration of civilized society nationally, creates continuing criminal activity in the county, and is a deliberate illegal attempt (at least as of now) to change the character of our local community. The argument that an income is needed by some to continue ownership of their property is false, at least for the three owner/violators known to me. Perhaps others do need “some” extra income to break even. We should not hurt those parties, but they already have a solution. Their recourse is a monthly rental until sufficient funds are raised. One activity is driven by illegal economic goals, the other is legal self- preservation. Regardless, the argument is a “sympathy” appeal with no bearing on the topic at hand. We, as a community, are obligated to stop this illegal activity now, permanently, or at least until the law changes. How do we achieve that goal? A one-word answer: Injunction. We must petition a judge, who has the power to fine in significant amounts and/or jail any short-term rental owner who is held in contempt for not obeying his order. The first sentence of 10 days in jail and a $20,000 fine will stop this illegal activity. I hope that a jurist would find it within his authority and justified by the current law to grant said injunction preventing this illegal activity to continue in our rural, quiet, minimally traversed community of Big Sur. 2. An Article 78 proceeding, to force Code Enforcement to do their duty, will not be fruitful. I have spoken with the Department. I am told, they do not have the resources. they do not have the personal (i was directed to the County site to confirm there is a published job opening for a Code Officer). They are not authorized to work over the weekends (when the violations occur. I asked how can we secure the evidence of illegal activity if the rentals occur, Friday night thru Sunday afternoon. ?….their reply, “we will catch them thru internet ads”). Most jurists will require we exhaust all other remedies before an Injunction will be granted. It is clear to me, Code has admitted and confirmed, they are unable to perform the task necessary. We have exhausted other avenues to get the Law enforced. An Injunction is our remedy! 3. The County has accepted monies from a continuing illegal activity. Collecting an occupancy tax as a percentage of illegal income appears to be ,on its face, also illegal. Clearly, it is confirming and encouraging continuing, illegal activity. The County becomes a co-conspirator. I believe the County is violating the RICO Statutes? Is it not an admission of guilt by the STR owners that they have broken the Law? Of course it is….where are the large fines and jail time for these habitual criminals? 4. I agree with Chris Counts published work, that the Permit to Access ordinance will become significant when and if STR status changes here in Big Sur. The Law, as written, appears to allow the County to sidestep its responsibility upon a turndown vote by the residents to allow STR owners, then zoned for commercial use, to avail themselves of our private road systems; Throws it back to the Court, not Code, to determine whether our private road system can be used for STR traffic despite the lack of permission.. Please note, by Traffic Engineering definition, switching from longterm rental/ownership occupancy, to STR use, increases the daily traffic use on our roads, ie. in a 3 bedroom residence, from 3 trips per day (longterm occupancy) to 9 trips (STR). It is clear we will be burdened with additional traffic and use as will Route 1. 5. Many of our deeds were first executed in the 1970’s..Our easement/ROW language grants permitted uses. The ROW language, excludes, by its silence, those commercial STR uses. ( it is clear listing all non permitted uses would take pages of text if reduced to writing in our deeds). 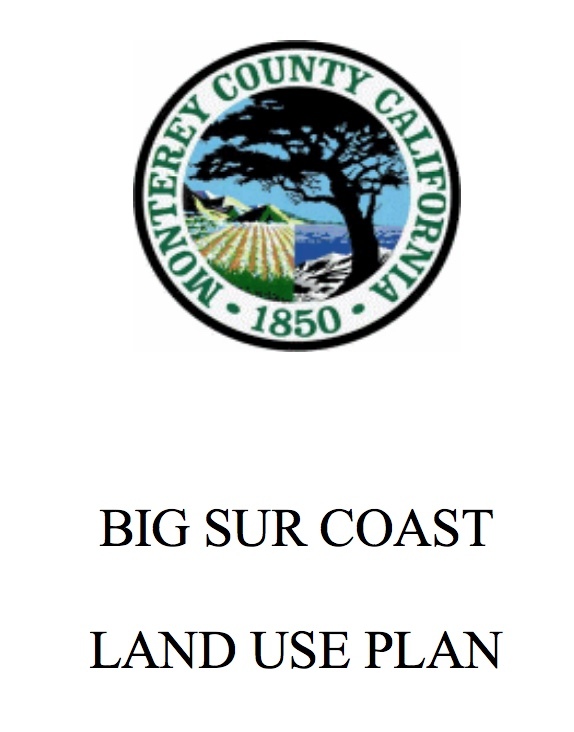 Owners did not purchase a private residence in Big Sur, to then operate it, as a commercial/STR business which has never been legally permitted.. The verso is true, it was a quiet, remote location, not an overnight party venue apart from the few permitted lodging stops directly on Route 1. The change occurred when current economics made it too tempting not to violate the law and take the illegal gains, especially when neighbors are quiet, respectful and not inherently confrontational. We all must strive to preserve those qualities which initially brought us to this jewel on the coast, currently contaminated by this criminal STR activity.. Simply put, no illegal STR activity should be tolerated. 6. Interested, anti STR big sur residents are on the cusp of raising litigation funds to protect our rights and preserve the beauty and unique habitat of our Community. At the present time, this could be quickly settled if the residents and the County obeyed and enforced the Law. Sadly, their activity or lack thereof, is a reflection of our time. If the Federal Government can cherry pick which laws it will or will not enforce, to me, it is not astounding that a County Government will fall victim to that same selective disregard for the written Law.